Kayleigh Sara Mould’s inebriated and inept driving led to an unexpected offering beneath Hamilton’s 27-metre-high Christmas tree – her crashed car. The spectacular incident led to the 35-year-old Cambridge woman making an appearance in the Hamilton District Court on Friday, on charges of careless driving and driving with excess blood alcohol. It was around 9.25pm on Monday, December 17 when Mould was travelling north on Victoria St that she lost control while travelling over a speed bump near Garden Place. 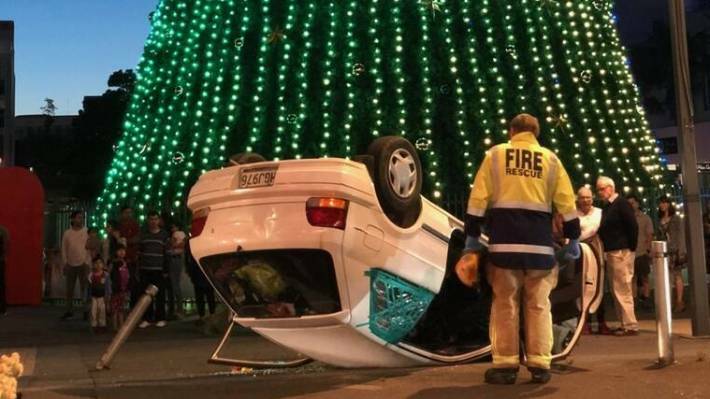 The Toyota then smashed into a bollard and rolled, coming to rest upside down next to the 27-metre-high tree that is erected in the town square each festive season, and where crowds of onlookers and revellers had gathered. The speed at which Mould was travelling at the time remains unknown. No-one, including Mould herself, was injured in the crash. According to the summary of facts, she attempted to flee the scene but was quickly apprehended by the police. She was taken to the Hamilton police station. A sample of her blood was taken and, despite telling the police she had consumed only “one or two drinks”, she returned a reading of 149 milligrams of alcohol per 100 millilitres of blood – about three times the legal driving limit of 50 milligrams. Mould had one previous drink-driving conviction that she incurred 14 years ago. As community magistrate Ngaire Mascelle observed, “it was nothing like drawing attention to yourself, and you have done that in spectacular fashion. Mascelle fined Mould $1000 and ordered her to pay $130 in court costs, and $111 in analyst’s fees. She also disqualified Mould from driving for eight months.